Club Penguin Cheats by Mimo777 Club Penguin Cheats by Mimo777: Snow Forts Are Sprouting? Dude, I'm not sure how these sprouts are growing out of the snow or what kind of plants they are, but I do know it has something to do with the Earth Day Party coming next week! Woot! I've been playing CP for several years and I check your blog sometimes just to see how CP is going. Since when has Mimo been aqua? Hello Mimo777 Look: Arctic White is a color in Club Penguin. It will be released at the Earth Day 2012 party. But hackers got it before. It was first found it one of Club Penguin's files. If you go on the server Sleet, you have a high chance of seeing hackers that already have the color Arctic White. Hello Mimo77 Look:Arctic White is a color in Club Penguin. It will be released at the Earth Day 2012 party. But hackers got it before. It was first found it one of Club Penguin's files. If you go on the server Sleet, you have a high chance of seeing hackers that already have the color Arctic White. i cant wait to buy those new animal costumes!i wasnt a member during last years earth day party. and mimo to show cp that i am totally waiting for card jitsu snow i have my fire ninja helmet and water ninja robe on. Mimo has been Aqua since 2009. Hey Mimo do u ever wonder why the ice rink turns into the football stadium? Well I might have the answer to that and the plants at snow forts. First of all Cp might have been green at first with grass and flowers probably its nearly summer the plants underneath the snow starts to come out.And the sand at beach. How come there was sand? So like I said probably Cp was an normal place with grass and flowers until the snow started to fall. 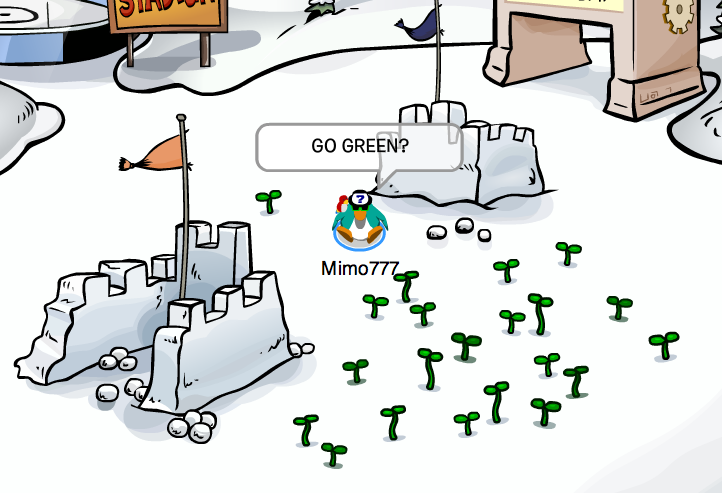 actually its because of the earth day party and club penguin just likes to have grass in the summer instead of ice at the stadium. and when the beach was being made it had no sand it was ALWAYS snow. sorry to correct a CPG mod. Space Heroes Party this weekend with MIMO! Club Penguin April 30 Featured Igloos! Club Penguin Issue 4 Magazine! New Free Club Penguin Coin Codes! Club Penguin "What's Different" Contest Winners! Club Penguin New Message form Rookie! Club Penguin Log Off Screens! Will You Save or Destroy the City? The Club Penguin Field Op Number 79 Cheats! "Ruby and the Ruby" Returns to the Stage! Club Penguin Time Issue #340 is Here! New Penguin Color Coming Soon... WHITE! New Earth day Party Safe Chat Phrases! 2012 Earth Day Party is HERE! Club Penguin Pin Cheat - FOREST PIN! The Club Penguin Field Op Number 78 Cheats! Club Penguin Time Issue #339 is Here! Club Penguin New Party Rooms Sneak Peak! Club Penguin Parties and EPF Coolness! New Series 12 Plush Puffle Toys! What's the Deal with Club Penguin and Earth Day?! The Club Penguin Field Op Number 77 Cheats! Club Penguin Time Issue #338 is Here! Club Penguin Earth Day Party Start Screen! Club Penguin Pay Checks Are Here... Finally! Club Penguin Magazine Secret Agent Edition! No Club Penguin Pay Checks? Club Penguin Catalogs and Egg Hunt by Happy77! Club Penguin April 2012 Treasure Book Cheats! Club Penguin Pin Cheat - EASTER BASKET PIN! Club Penguin Easter Egg Scavenger Hunt! The Club Penguin Field Op Number 76 Cheats! Club Penguin Time Issue #337 is Here! Club Penguin April 4th Featured Igloos!